I promised myself two things I’d do in India; find my relative’s grave and see Mt. Everest, a typical tourist attraction that gets people hailing jeeps at 4am. So rising earlier than I ever remembered we joined the party. The jeep we grabbed only had 3 spots left so the guys climbed on top to receive a morning wake up they weren’t expecting. At some point the cars halt and we’re told to start walking. 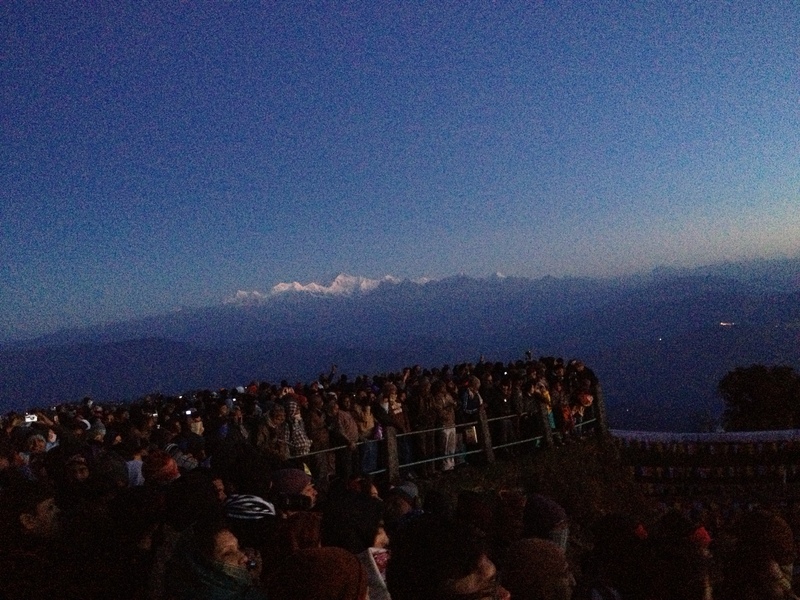 Paying 10rs ($.18) a piece to get a spot for the view, we pushed on like cattle stumbling up the pitch dark hill. I have never seen so many people move at this time, it’s comparable to the disgusting midnight Black Friday shopping. We arrive grab a spot in front of the fence and wait for the sun. I couldn’t help but laugh at the situation in front of me. We were all here for the same reason to see these Nepalese Mountains shine in the sun, but as the light slowly crept the crowd cheered. Cheering for the sun? This is something new, but I joined in my fellow viewing friends and waited for it to rise. My pictures don’t do it justice. The snow-capped range was unlike anything my eyes have ever seen. Ignacio pointed to Mt. Everest and said ok, we’ve seen let’s go. We hopped down to get closer to find out we weren’t staring at the tallest peak but it was farther to the left. This tiny, minuscule peak in the distance was it. What I was dreaming about before I even left India. The size was laughable compared to the surrounding mountains, but my early wake up was worth it. Next time I see that mountain, I’ll be below it looking up. Nepal 201?